I often try my best not to think about my absentee dad, a man who hasn’t tried to contact me since I was 11 years old. We didn’t have a rough relationship. I’d stay with him on weekends. We’d go to the beach boardwalk and walk around. He’d play an old Gorillaz cassette tape with the song “Clint Eastwood” on it, and I’d nod along, wishing I was as cool as Del The Funky Homosapien. Then it was crickets. There were no more phone calls, no more weekend excursions. My mom couldn’t ever articulate to me why he didn’t call anymore—but how could she? I was just a kid. One day, I found odd solace within an unlikely game protagonist, the adorable spaceship Opa-Opa of Fantasy Zone. This Sega arcade classic was the cheeriest shoot-’em-up of all time, so adorable that it partially spawned a new sub-genre of similar “cute-’em-ups,” ever-scrolling shooters with gleeful aesthetics. “I wanted to make something bright, with a pop sensibility,” explained the game’s designer, Yoji Ishii, in an interview with Japan’s Shooting Gameside magazine. But after fighting through eight levels of vibrant cheeriness, Fantasy Zone unleashes its strangest quirk: a bleak ending with a daddy-issues twist. In the first game, you eventually face the leader of the evil forces of Menon, an enemy planet that destroyed the interplanetary monetary system and threw the “Fantasy Zone” into turmoil. After an intense battle, Opa-Opa defeats the Menon leader, and learns that the ominous, similarly shaped ship is actually his own long lost father. Now carrying “mixed emotions,” Opa-Opa’s journey comes to a close. There’s “one burning question that will remain with him until his dying days,” the epilogue reads. “Was my victory really worth the price I had to pay?” Then, that’s it. The end. Opa-Opa accidentally killed his evil dad and feels really bad about it, despite the father figure never seeming to be around. It’s a downer twist in a game that’s otherwise engineered to make the player feel good. Initially told by his boss to create a space-bound shoot-’em-up to rival Konami’s hit Gradius, Ishii decided to push back against expectations. “I doubted whether players would be interested in a mere knockoff,” he explained in his Shooting Gameside retrospective. “And personally, as a creator, I wanted to make something more colorful and showy.” So Ishii introduced Brazilian culture as an inspiration to his designers, and the hyper-colored exuberance of Fantasy Zone was born. Its creators married numerous cutesy elements together, like the cheerfully designed characters (enemies included), pastel-colored art, and a samba-inspired soundtrack by composer Hiroshi Kawaguchi. In crafting a striking arcade shooter like no one had ever seen, Sega orchestrated a classic. That generous use of color has always been the central draw of Fantasy Zone and differentiated it from its shoot-’em-up peers. Mark Rothko, the great Russian-American abstract expressionist painter, once described color as “merely an instrument,” a tool for him to create specific emotions in the people who viewed his work. Ishii sought what was essentially the same goal with Fantasy Zone, but he aimed to evoke joy, rather than the theme of death that permeated Rothko’s work. So it’s strange that the game would swerve so drastically in its last moments via text exposition, even if the twist was allegedly intended to mock Empire Strikes Back’s “I am your father” moment. Besides a cursory explanation at the start of the game, Fantasy Zone goes plotless for its entirety, as most arcade games did back in the day. Then there’s suddenly this knife-turning realization at the conclusion. Opa-Opa’s difficult journey doesn’t end in relief, it ends with tragedy and internal conflict. Rather than retiring and reflecting on the events of the first game, the little spaceship leaps at the opportunity to mortally endanger itself again in Fantasy Zone II: The Tears Of Opa-Opa. Once more, he coasts through eight stages, confronts bosses of all sorts, and progresses onward through the Fantasy Zone. The final boss, like the first game’s, eerily resembles Opa-Opa. But instead of being his father, it’s revealed (again, through walls of text) that the evil mastermind is none other than Opa-Opa himself—the evil half of his personality made manifest as a giant doppelgänger. “Due to the emotional stress brought about as a result of a war during his childhood,” reads the post-boss text, “he developed a dual personality of virtue and vice, unknown even to himself.” It’s revealed that Opa-Opa’s dad had taken on the evil army to lead in the first game because of his son’s affliction and split-beings nature. With this revelation, Opa-Opa finally feels at peace. He lets those tears fall and is at last on the path to feeling A-OK.
That is until the 2008 remake of Fantasy Zone II, which rewrites its bittersweet ending. This very delayed follow-up has three different conclusions: one “bad” ending and two “good” endings that are more or less the same. All the finales carry on the legacy of the first game’s tragic conclusion to varying degrees, as Opa-Opa once again faces a doppelgänger boss and is met with two personality-splitting outcomes. 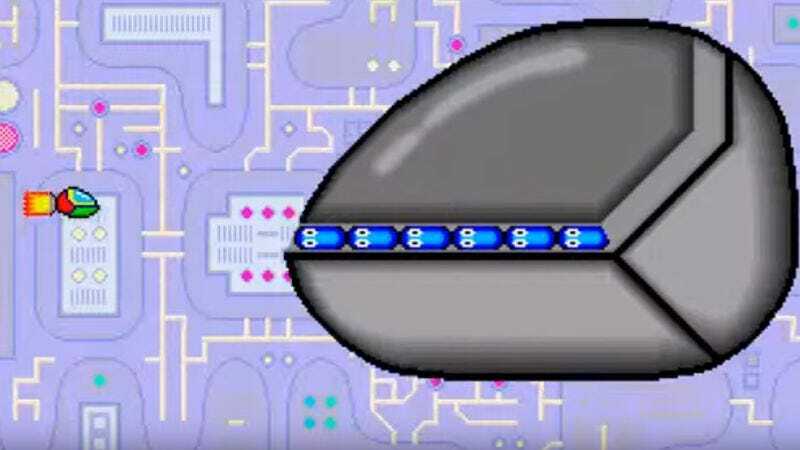 Each of the game’s levels have two variations, and if you go through all the Bright Side zones, the easier version of the stage, the ending has you learning that Opa-Opa has turned evil and the final boss is actually the “good” Opa-Opa. In this version of events, evil Opa-Opa destroys his logical half and learns that some familiar Sega heroes are on their way to finish him once and for all, even though it’s probably too late and the Fantasy Zone is pretty much dead. During the game’s “good” ending (achieved by playing through the more difficult Dark Side zones), the player is revealed to still be the virtuous Opa-Opa and does away with evil Opa-Opa in the final boss fight. If you don’t use the “Drop Tear” item on the boss, then you won’t learn of its true nature and Opa-Opa’s identity crisis. With or without that revelation, peace is restored to the Fantasy Zone once again. Fantasy Zone’s rebuilt sequel expands on the dark issues poked at in the first game and buried in the text of the 1987 sequel’s ending. The remake’s good ending shows Opa-Opa withstanding his hereditary darkness and trauma, whereas the bad ending has Opa-Opa collapse into despair and find solace in villainy, just as his deceased father once had. Fantasy Zone’s legacy isn’t in the forgotten dark tinges of its story but its cheery aesthetic, the cute-’em-up style that inspired leagues of other style-savvy shooters. But grief and consequence weigh upon the series’ adorable sentient spaceship. Even if Opa-Opa learns to forgive and forget his hardships in the first iteration of Fantasy Zone II, I can still happily peck away at any of his adventures knowing that, in his heart, he’s just like me. Just another kid who hates their dad.